It’s called Snart Skiner Poseidon and it was written and sung by Joel Alme, a pop singer from Gothenburg. 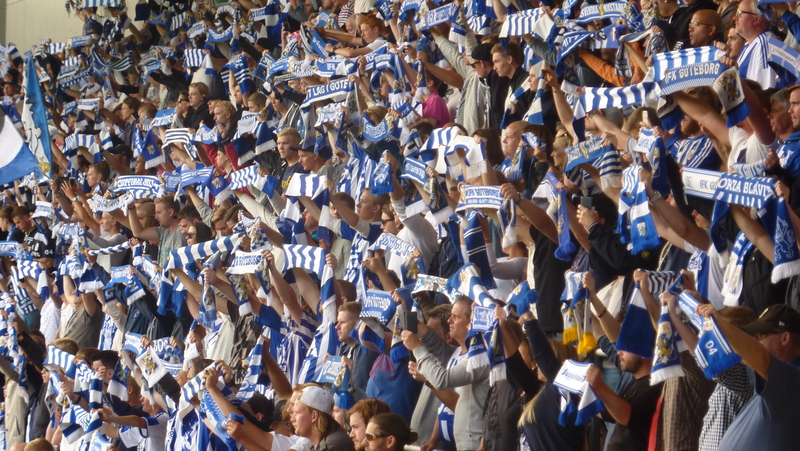 It’s the club song of IFK Goteborg and by all accounts, the fans love to sing it before every home game. It’s performed with true passion and emotion, scarves aloft and with the odd tear in the eye. Actually, it’s quite moving to experience. Let’s not forget that catchy songs are something of a trademark of the Swedes – “Voulez-vous, a-ha”. 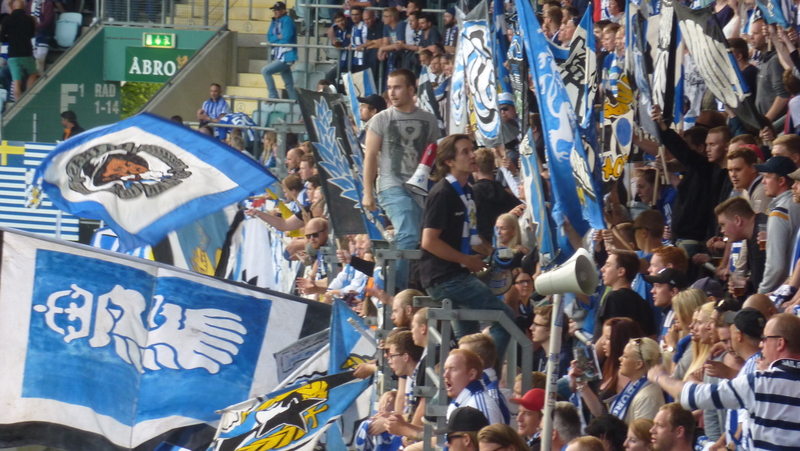 When we heard it, the stadium was almost packed to capacity – a crowd of 16,728 for the top-of-the-table clash between IFK and Norrköping. Gothenburg was teeming with young track-suited footballers all weekend – it was the start of the Gothia Cup, the world youth tournament. We bumped into teams from Bromley, Paulista, Wolfsburg, St. Etienne and other assorted clubs from various parts of the world. And they all seemed to want to visit IFK. It’s a confusing place, though. Two stadiums sit almost side-by-side along the Ullevi Gatan: the old ground, known as the Nya Ullevi, was built in the 1950s for the 1958 World Cup; the Gamla Ullevi, which was constructed in 2009, is the home ground of Gothenburg’s major clubs: IFK, GAIS and Orgryte. The Nya Ullevi is a very distinctive place, with a design that was extremely modern in the 1950s. Its roller-coaster appearance marks it as one of the most iconic of European stadiums. Pele, in 1958, made his World Cup debut at this ground. As for the Gamla Ullevi, it was built on the site of a former stadium, hence the more modern of the two along Ullevi Gatan is called Gamla (old). It’s purely 21st century, function over form, but neat, comfortable and very uniform. The atmosphere is superb, especially if you are in earshot of the upper tier bank of supporters that provide the soundtrack for IFK games. The fans were orchestrated by a trio of supporters with megaphones. They didn’t stop signing for the entire 90 minutes, despite the game falling below expectations. 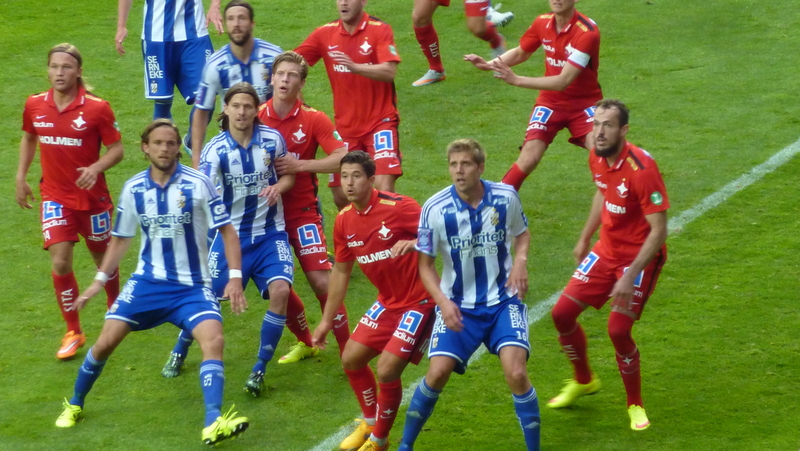 IFK are Sweden’s top club and the most “international” from Scandinavia. They’ve won two UEFA Cups, after all – the first in 1982 under Sven-Goran Eriksson, the second in 1987 when they beat Dundee United over two legs. They’ve also won 18 Swedish titles and seven Svenska Cupens and have reached the last four of the European Cup/Champions League twice. Before meeting Norrköping, they had lost just once, a single-goal defeat to Malmo at home. Their success seems to have been based on a strong defence, because they had scored just 21 goals in 14 games. Their leading scorer, the Dane Lasse Vibe, had netted half a dozen goals. Vibe is popular with the fans – he runs around a lot, keeps busy but his finishing needs improving. Last season he scored 23 goals in 26 league games, though, so perhaps he’s just a little off-song at present? Norrköping actually looked the better side in the first half. They were certainly more positive in their approach, with Emir Kujovic and Christoffer Nyman causing problems. With a little more pace, they would have inflicted greater damage on the home side. Vibe’s pace troubled Norrköping on a number of occasions and there was a heated penalty appeal when he was sent sprawling in the area. Just before half-time, Vibe wasted a good chance after a defender slipped up and allowed the little front-man space to get in a shot, but once more, the final touch was found wanting. Although the first-half ended goalless, it hadn’t been a bad 45 minutes and the quality was certainly higher than the Halstad v Kalmar game the day before. The second half failed to catch fire, though, and it became quite clear that both sides would settle for a point. With five minutes remaining, though, Goteborg were awarded a penalty after Haitam Aleesami’s cross was handled in the area. Midfielder Jakob Andersen, another Dane, saw his kick saved by David Mitov-Nilsson. It ended goalless, which was disappointing, but the singing went on. IFK also drew 0-0 in the Europa League a few days later. They may be top of the league, but you get the feeling that the lack of a prolific striker could be their undoing. Like Halmstad 24 hours earlier, there was a good feel about Goteborg. It was also a family affair and the interaction between the young supporters and the “ultras” (a loose term) was really quite delightful. While the noise at English football is largely based on hatred of the opposition (listen to any game involving a London club and Liverpool, for example) English football could learn a lot from the Swedes. Perhaps that’s why someone wrote a book recently about Scandinavians called “The Almost Nearly Perfect People”?